I would like to regale you with tales of wonder and beauty. Gather round, for stories of the best sunscreen in all the land. I have crazy sensitive skin and sunscreen makes me break out like nobody's business. I'm also ghastly pale, porcelain, if you will, and thinking too hard about sunshine makes me burn. I bought this stuff from my local health food store in May and you guys? I have not been burned A SINGLE TIME that I have used this stuff. (I have gotten burns on days when I forgot to apply, but c'mon, no one's perfect). 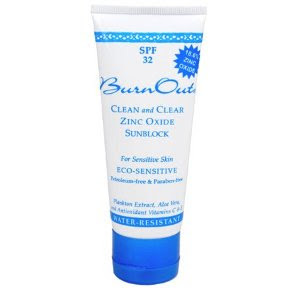 Sunblock that works, that doesn't make me break out or itch or feel greasy. Very water resistant (I've been swimming with it). Goes on clear even though it's zinc oxide sunblock. What I'm trying to tell you is that this stuff is awesome, and you should buy it. Link is the affiliate kind, but I'd be just as pleased if you bought it locally. This was an unsolicited post, just wanted y'all to know that I found a sunscreen that I love, having searched high and low. It's not at trader joe's (I've checked). It's probably at Whole Foods though. I found it at New Leaf which is the local equivalent, and I've seen it at a couple other health food/natural-type stores since. I've taken to hiding under a giant hat, but a sunscreen that works would allow people to see my face again. Will find and try and report.